Chilled water is often a requirement in industry. Whether keeping a mold from over-heating in a plastic-injected manufacturing operation, or making sure ingredients don’t spoil during food production, or ensuring critical medical equipment is kept online, process chillers are at the heart of many operations. Many times, if the chiller goes down, the whole process shuts down. Therefore, the chiller shouldn’t be seen as an afterthought, but as a vital tool at the heart of any company. The list of standard features on the CHL chiller line is extensive. 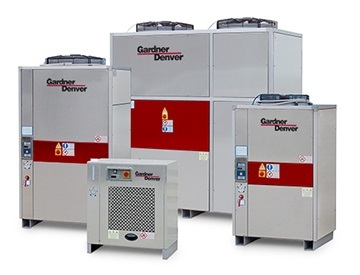 While many competitors charge extra for these features, or make the customer specifically request them, Gardner Denver has included these features as standard. We did this to ensure you end up with a high-quality process chiller that exceeds your expectations. Not all features are available at all sizes. Please see our price book for details. Easy installation – Unlike many competitive units that have ventilation grills on two sides, CHL chillers only have ventilation grills on the back. That allows the unit to have minimal clearance on both the right and left side and also reduces the required floor space. Easy to use – Plug and Play – With the CHL, we offer a fully-integrated solution with expansion tank and bypass. Easy maintenance – All of the galvanized steel panels can be easily removed given you full access to every part of the chiller. In addition, the CHL comes standard with a washable air filter. Best components – From the “No Frost” heat exchanger, to the Copeland scroll compressor and the CAREL microprocessor, every component on the CHL is the best on the market. The result is a long-lasting, worry-free unit. Environmentally friendly – The CHL uses less energy, uses environmentally-friendly R410A refrigerant and experiences a long service life. All of those facts contribute to a lesser impact on the environment.